Trendsetting place where urban mode is packed into an elegant space reminiscent of European streets. Streets paved with marble and brick, conveying an atmosphere of good quality and sophistication that combines relaxation and a glamorous air, where unique trend-setting shops stand side by side. "DIAMOR OSAKA," underground main streets located at Umeda, Osaka, where approximately 2.5 million people come and go everyday as a traffic hub of the Kansai area, is filled with an open atmosphere and soft natural light, which is not what we expect from an underground space. The complex contains all kinds of fashion, beauty, and cosmetics shops as well as cafes and restaurants. DIAMOR OSAKA transmits up-to-date topics that color the life styles and daily scenes of people, targeting women highly sensitive to the newest trends and leading advanced urban lives. The streets constantly provide fashion, goods, and information of "good quality and sophistication" ranging from daily to special products, which satisfy people with particular tastes, and continue to evolve at every moment. Customers meeting the following requirements may receive a sales tax (8%) exemption. When departing Japan, the purchased item must be presented at the customs counter along with the ‘Purchasing statement’ put in your passport at the store of purchase. When checking the purchased item with your baggage, confirmation by customs is required. Please notify your airline at the check-in counter. ☆If you have any questions, please ask the staff at our duty-free shops. Cash advances are available for foreign-issued credit cards. Logos for accepted credit cards are displayed on or near the ATMs. An additional 200yen~400yen will be charged for each extra day. *Use for 4 or more consecutive days is prohibited. Please remove belongings within 3 days. Touch panel type / 100yen~200yen per 3 hours of use	After the initial 3 hours, an additional 100yen~200yen will be charged every following 3 hours. International calls can be made by direct dial from pay phones with "International & Domestic Card/Coin Telephone" displayed on them. This room offers a diaper-changing bed and water heater for formula. In order to maintain the safety of our shopping complex, police officers patrol the facility carrying out various activities related to customer security and crime prevention. For articles left in Diamor, please contact the following centers. Modeled on the Italian shopping district ‘Galleria’ in Milan, DIAMOR is home to a wide array of artwork. 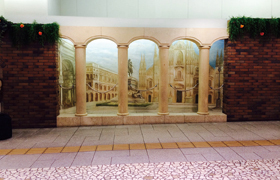 Here’s a mural depicting Piazza del Duomo (Cathedral Square). 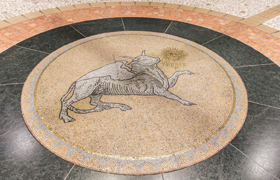 Our elaborate mosaics are done in the style of the actual Galleria in Milan. 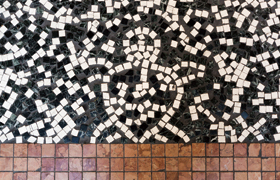 Look, a turtle in the floor mosaic! The tile craftsman left us a little surprise. Official website of OSAKA AIRPORT TRANSPORT CO., LTD.
Official website of Kansai Airport Transportation Enterprise Co., Ltd. Please click on the nearest station. Once you tap on the station name below the map, the route to Diamor will be displayed. * There is no parking lot dedicated for DIAMOR OSAKA. Use one of the pay parking lots around the mall. Copyright © DIAMOR Osaka. All Rights Reserved.